In your imagination, climb with me to the top of one of the great vantage points in our valley, such as Roxy Ann or Grizzly peaks. Looking out, what do we see? In the distance are the dark conifer forests of the mountains: U.S. Bureau of Land Management and national forestland. At our feet are the spreading towns and developments clustered along Bear Creek and the Interstate 5 corridor. And in between, we see a varied, pleasing and productive rural landscape of farms, orchards, vineyards, pastures and ranches. Without any doubt, this rural countryside is fundamental to the quality of life that we enjoy in Southern Oregon. It is essential to our economic health, our agricultural productivity and our regional identity. It is also the most threatened part of our landscape. Without thoughtful protection and management of these lands, we could easily lose our most productive rural countryside in the next few decades. For example, if the Regional Problem Solving plan for the Bear Creek Valley is approved by the state, 7,000 acres of farmland eventually will be swallowed by urban sprawl. Fortunately, community efforts to preserve Southern Oregon's rural lands are well under way. 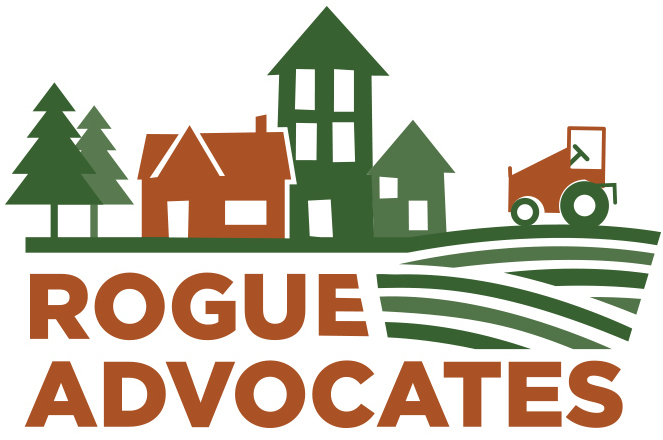 On Feb. 23, I attended a forum in Central Point on the future of our farmland and rural landscapes, hosted by the grassroots land-use group Rogue Advocates and the statewide 1000 Friends of Oregon. Part of the Envision the Rogue Valley project, this event attracted farmers, grape-growers, ranchers and concerned citizens like me. We discussed topics such as establishing buffers between towns and farms, protecting farmland from development through zoning and economic incentives, and boosting agricultural education in Southern Oregon. I encourage everyone to weigh in on this discussion. It's easy to do: just fill out a short survey (with plenty of room for your own ideas) on rural lands conservation at: www.dailytidings.com/farmland_survey. Remember: Without farms, no farmers' markets. Without local agriculture, no local fruit or wine or beef or cheese. If we don't protect our rural lands, we will be left standing, hat in hand, at the off-ramps from I-5, waiting for what the outside world chooses to give us. And no one wants a taste of that future. Pepper Trail is a board member of Rogue Advocates and a longtime local activist, naturalist and writer who lives in Ashland. Farmer, rancher and local-food supporter Joel Salatin of Polyface Farm in Virginia will be interviewed by Geoffrey Riley on the Jefferson Exchange at 9 a.m. Wednesday (KSJK-Talent, AM 1230) about Salatin's approach to farming that has earned him approval from natural food supporters but has frequently put him at odds with farm regulators. Salatin, a main subject of the popular book "Omnivore's Dilemma," also will be speaking March 15-16 at several fundraisers for the education and advocacy programs of Project Rogue Valley, a part of the Jackson County Local Action Coalition supporting self-reliance and natural resources (http://jclac.org). I agree with your opinion.It's great.